Earth is losing its darkness. A new study using satellite data finds that artificially lit surfaces around the world are spreading and growing brighter, producing more light pollution at night. The findings, described in the journal Science Advances, track what researchers called a worrisome trend that has implications for the environment as well as human health. "This is concerning, of course, because we are convinced that artificial light is an environmental pollutant with ecological and evolutionary implications for many organisms - from bacteria to mammals, including us humans - and may reshape entire social ecological systems," Franz Holker of the Leibniz-Institute of Freshwater Ecology and Inland Fisheries, one of the study's authors, said in a briefing. Thanks to electric lights, outdoor lighting grew at a rate of 3 percent to 6 percent annually in the second half of the 20th century. While this has benefited human productivity and safety, it has come with a dark side: The night is no longer dark enough. Half of Europe and a quarter of North America have experienced seriously modified light-dark cycles, the study authors wrote, calling it a "widespread 'loss of the night.'" 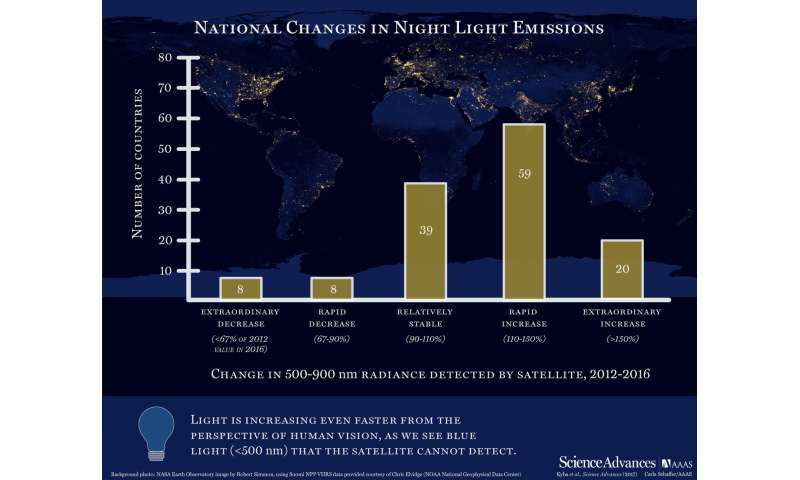 This light pollution can have serious consequences for living things, which have evolved in accordance with a natural day-night cycle, where the only major sources of light at night would have been the moon or more intermittent sources such as volcanoes, lightning, wildfires or auroras. "From an evolutionary perspective, now, artificial light at night is a very new stressor," Holker said. "The problem is that light has been introduced in places, times and intensities at which it does not naturally occur, and many organisms have had no chance to adapt to this new stressor." That's a big problem, given that 30 percent of vertebrates and more than 60 percent of invertebrates are nocturnal, he pointed out. It can affect plants and even microbes. It also could be harming vital interactions between species, such as the pollination of plants and spreading of seeds by key nocturnal creatures. "It threatens biodiversity through changed night habits, such as reproduction or migration patterns, of many different species: insects, amphibians, fish, birds, bats and other animals," he said. Humans are impacted by artificial light too because there are certain physiological processes that happen during the day and certain ones that happen at night - and they often work against each other, Holker said. That's why working against our biological day-night clocks (for example, as night-shift workers must) can result in many kinds of issues, from depression-like symptoms to obesity and diabetes. And of course, the more light pollution there is, the fewer stars we can see - which makes it difficult for astronomers to study the heavens with ground-based telescopes. To find out whether the human demand for light is still on the rise or leveling off, an international team of scientists used the Visible Infrared Imaging Radiometer Suite, also known as VIIRS, a satellite sensor that's a collaboration between NASA and the National Oceanic and Atmospheric Administration. The researchers studied data from the month of October in each year from 2012 to 2016. They found that over that time, Earth's artificially lit outdoor surface grew by 2.2 percent each year, and the total radiance grew by 1.8 percent per year. On top of that, the outdoor areas that already had been lit when the study started in 2012 also brightened by 2.2 percent per year. The fastest growth took place in countries in developing regions, such as Asia, Africa and South America. Countries that already were brightly lit, such as the United States and Spain, appeared stable. A small number of war-ravaged countries such as Yemen and Syria saw a drop in their artificially lit levels. But even in those brightly lit countries that appeared stable, light levels are probably still on the rise, the scientists said. That's because many well-lit cities have been replacing yellow-orange sodium lights with energy-saving LED lights. Those sodium lights put out a small amount of infrared radiation, which would have made them look brighter to VIIRS. The white-toned LED lights have more blue wavelengths, which VIIRS cannot see. The combination of losing the infrared signal and not being able to see the blue wavelengths means that VIIRS registers this areas as dimmer, even though they may be brighter than they were before. "That means that this measurement that we're reporting is a lower bound on how Earth's light is increasing," said study lead Christopher Kyba of the German Research Center for Geosciences. "And in fact, the true increase that a human being would perceive is actually larger than what we report here." Researchers had long suspected that the introduction of LEDs would mean less energy used for lighting, he said. The problem is this also made lighting cheaper. "Whenever you make lights more efficient, you just don't save energy," Kyba said. "What happens instead is that people put more lights up." The blue light in those LEDs also are particularly disruptive for many nocturnal animals, researchers said. There are some possible solutions, Kyba said, such as using LEDs that don't have a blue component. There also are ways to position and manage existing light sources - say, the lamps in a parking lot - so that they are not as bright but still are effective. Such solutions could save cities a lot of money, he added. "We're very interested in working together with cities and with local governments, with industry partners, to try to find ways that we can eventually reverse this trend," he said.